The Earl of Rutherford was used to flirting with scandal. But when an act of charity placed his charge’s spotless reputation in jeopardy. Marcus knew he must do the honourable thing. There was no point pretending he was in love. So in return for Miss Marguerite Fellowes’s discretion and children, the earl offered his name and protection. Then Marcus watched as proud Meg blossomed in London society. Meg’s smile was perhaps the loveliest he’d ever seen, and the glow in her eyes made him feel wildly out of control. 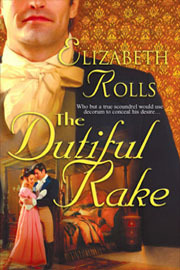 Tantalised by her evident passion for life, the dutiful rake found himself consumed by far from innocent desires.